In November of 1933, an article in the New York Herald Tribune announced the arrival in New York of the schooner CARLSARK (ex. 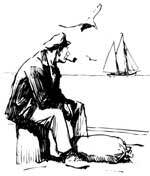 MARIT) – Carl Weagant, skipper – having completed a passage from Newfoundland. This article stated that Weagant would welcome visits from yachtsmen. Three men, strangers to each other at the time, joined Weagant for a gam. In this hospitable circumstance, conversation turned to the problem of owners finding crews and sailors finding berths. The three men were Carleton S. Cooke, Frederick M. "Ted" Delano, and Harold S. "Skipper" Smith. Cooke and Delano had spent some time in England and knew of the Little Ship Club there. By the end of the gam, it had been decided to start an organization in this country modeled along the lines of England's Little Ship Club. This would be a club to include people at all economic levels, regardless of the extent of sailing experience, provided they were agreeable gentlemen interested in sailing and of acceptable character and personality. In January, 1934, Cooke, Delano, and Smith, joined by George F. Adams and Paul Findlay, met in New York to plan an organization. An organizing meeting was then held in February attended by 50 interested boat owners and non-owners. A launching meeting was projected for April. The launching meeting in April was attended by 76 members and guests. The familiar Gordon Grant figure above, which has graced The Corinthians' letterheads, yearbooks, and Mainsheets, was unveiled. 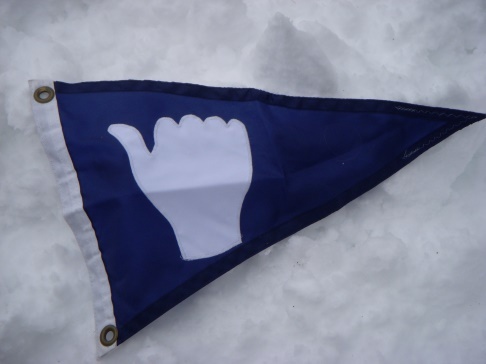 An original burgee, since replaced, was adopted. This displayed a white hitchhiker's hand with outstretched thumb on a blue background. Even a Latin motto, since discarded, was presented - "Ut in alienis navigis navigamus," meaning, "In order that we may sail in other men's boats." Since its inception, The Corinthians has enjoyed healthy growth. The organization numbers over 500 members (about three-quarters boat owners), mostly located from Maine to Virginia, with "Fleets" in New England, Mystic, Long Island Sound and the Chesapeake, each with local programs and interests. A close association has continued between The Corinthians and the Little Ship Club which assures a warm welcome in its clubhouse for Corinthians visiting London.